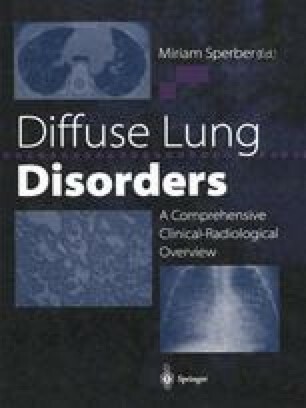 Diffuse interstitial lung disease (ILD) represents a heterogenous group of both acute and chronic disorders characterized by similar radiographic, clinical, and pathologic presentations. The differential diagnosis includes over 130 distinct clinicopathologic entities, thus making the diagnosis of ILD clinically challenging. Although little epidemiologic data is available, diffuse lung disease affects one in 3000–4000 people in Britain and results in 3000 deaths per year . In the United States, pulmonologists encounter this diagnostic and management dilemma in nearly 15% of their patients . Additionally, when less invasive measures are nondiagnostic, there is marked variability among practicing clinicians to pursue a specific diagnosis of ILD with open lung biopsy, ranging from 7.5% to 42% of patients with ILD [3,4].